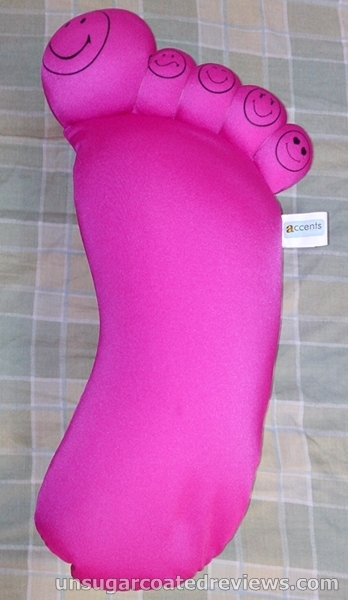 I've been hugging this hot pink foot-shaped pillow from Accents by Sleepcare since yesterday. Very soft and squishy and the design is pretty cute. I used it as a hug pillow when I slept last night and it was comfortable. It's not mine, alas, but a guest's. The toes have smiley faces and are denser and thus a bit harder than the sole. The pillow measures 50x27x12cm -- big enough to shield your face yet slim and light enough to not be suffocating or hot. If you share a sleeping space with others who are awake while you are asleep (or if you like taking naps at work), this is great to shield light from your eyes and to prevent others from seeing your unflattering facial expressions as you sleep. This pillow costs P250 and is available in other colors such as yellow and orange. The cover is 15% spandex and 85% polyester while the filling consists of foam polystyrene beads. It is handwashable, just do not use bleach. Thanks for sharing this post, I liked your foot shape polystyrene bead pillow I was also purchased this type of pillow for my home because pillow make our home attractive. But your pillow is so good I want to buy this fast, can you tell me the address where I get this pillow? Please!! Thanks for share with your foot shaped pillow collection. I see your pillow. its looke very good I think its also comfortable when we are go to sleep.Pillow is really need for our sleeping if our pillow is great design its also useful for our room Decoretion.